The Rev Donald Sage, in Memorabilia Domestica, described his time at school in Dornoch from 1801 to 1803, where Hugh Bethune from Alness was a close friend. Hugh Bethune came to reside at the manse, to attend MacDonald's school. 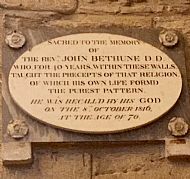 This young man was the second son of Mr. Angus Bethune, minister of Alness in Ross-shire, elder brother of the minister at Dornoch [John Bethune]. Hugh's mental abilities were not of the highest order, but he had a good, working mind, suited not so much for the higher walks of literature, as for the business of the world . . . Hugh Bethune afterwards went to the West Indies, in the commercial line, where he set up as a merchant in Kingston, Jamaica. He married and had a family, but was early cut off by fever. Although Sage refers to Jamaica, both Hugh, his brother John and a cousin, also John Bethune [the son of the Dornoch minister, John Bethune: memorial in Dornoch Cathedral illustrated left], were active in Berbice. The cousin John died there in 1804 [Scots Magazine]. By 1817 John Bethune owned plantation Lemlair in Berbice, named after Lemlair in Easter Ross - probabaly because his mother, Catherine Munro, was the lineal representative of the family of Munro of Lemlair. John died in Edinburgh in 1819 [Edinburgh Magazine]. By 1817 brother Hugh was attorney [agent] for the owners of three plantations in Berbice and is mentioned in the Fiscals Reports of 1819 in a case involving the sexual abuse of young female slaves by the manager of another plantation, Providence, in which he stated that had the offence been proved he would have dismissed the manager. He died in the colony in October 1821 [Edinburgh Magazine]. In 1820 their sister Ann married the founder of the Inverness Courier, Roderick Reach, who has been in Berbice; their sister Catherine married John McLennan of Berbice in 1821; their brother Hector became minister of Dingwall; and their sister Rose married Donald Ross, minister of Loth in Sutherland. Rose and Donald's son, Angus Rose Bethune Ross (b1811) died at plantation Penitence, Demerara, on 9 June 1841 [Aberdeen Jounal, issue 4884]. In 1823 a Miss C Bethune, Berbice, was a boarder at Henderson's Seminary for Young Ladies in Forres, where she was award a first prize in elocution and second prizes in music and grammar (Aberdeen Journal - Wednesday 09 July 1823). The following year a Miss J Bethune, Berbice, was also a prizewinner (Aberdeen Journal - Wednesday 04 August 1824). In Berbice in 1809 John Bethune (Alness) married Margaret, second daughter of the late David Barry, of the island of Grenada [Lady's Magazine]. In 1828 a John Bethune, at school in Dingwall, was described as the son of John Bethune Esq of Demerara [New Monthly Magazine]. This might be a son, although the reference to Demerara does not match. About 1819, the year in which John Bethune died, a daughter Jessie Munro Bethune was born in Berbice. She later lived with relations in Inverness and, in April 1861, died after drinking poison. Her death certificate, which unusually did not name her parents, referred to her having been in 'a state of temporary insanity' [GROS 098/00 0130].